Free Divi layout for Floating images between Divi Builder sections. Use this free layout to quickly add floating icons/images between your sections in the Divi builder. Just add your own image. modules below for images of 100px, 150px and 200px. If your is a different height open the image modules custom CSS tab and edit the margin-top to be 50% of the height of your image. The Divi floating section image below image alignment is set to left. The Divi floating section image below image alignment is set to right. 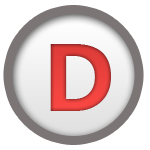 The Divi floating section image below uses an animated giff created at animizer.net.